Egypt is a mysterious young man who is almost always seen wearing a white keffiyeh. 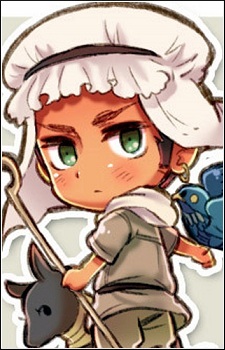 Underneath his keffiyeh, as revealed by some colored artwork by Hidekaz Himaruya, he has short dark brown hair. In the anime adaptation, he had dark brown eyes and fair skin, however, in official art by Hidekaz Himaruya, he was drawn with green eyes and an olive/tan complexion. He is depicted as being somewhat stubborn, but good natured, friendly, and family-oriented. He doesn't really talk much, but in one strip, he asked France if he wanted to buy some pots. Like Greece, if you dig you can find several mementos from his mother, and because of this, he thinks that it is perfectly fine if he doesn't modernize his ways too much. In a sketch, it was shown that he appears to know magic of some sorts. It also appears that his left ear is pierced. It is unknown if his right ear is pierced as well. Sometimes, he's drawn with an Anubis-like creature, but it is unconfirmed if it is really an Anubis.